As per the tradition folleowd by the Devasthanams, temple accounts begin from Dakshinayana (winter solstice) in July. Anivara Asthanam, the grand durbar festival of Lord Venkateswara, is celebrated on that day (usually on Julu 16). On this day the previous year's accounts are submitted to the Lord and begins a new financial yaea opening a new book. All the principal officers of the temple deposit their insignia of office at the feet of the Lord and take them back. The significance of the cermony is that the Lord allows them to hold their respective offices as He found them fit. 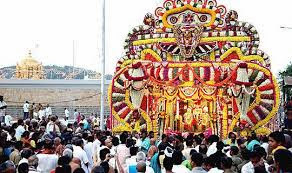 In the evening the Lord is taken round in procession on a richly decorated floral palanquin. It is a remarkable spectacle for devotees who patircipate in this arjita seva to see and enjoy the majestic presence of the Lord. Sri Malayappa Swami and His consorts are wxquistely adorned with ornaments and garlands during this seva.